Welcome to the Pyworthy Local History Group Website. We hope you find something to interest you in these pages and we welcome any comments you may have. If you are interested to learn more about us and our Parish, why not come along to our meetings. We are always pleased to welcome new members. Click here for further details. The Pyworthy Local History Group was formed in 2004 by John Burnard, Jackie Parrish and Diane Soall with a view to meeting on a regular basis to gather information, documentation and memorabilia of the Parish and to share it with present residents and preserve it for future generations. Our most ambitious project so far has been Indexing the gravestones in our Parish Churchyard, St Swithuns. The first stage of this project was completed by July 2013 and the Unveiling Ceremony took place on Sunday 7th July 2013 with Rev Chris Hardwick blessing our plan and Leatherbound Index. Many of Pyworthy’s visitors are from other countries often researching their family history. It occurred to us that Pyworthy did not have a comprehensive record of who was buried in our churchyard or more importantly where they were buried. Jackie and Diane decided to take on this task and planned to produce a list of burials and a plan for the Church showing where each grave was situated. It was whilst planning the project they realized that with a modest amount of money a more professional result could be achieved. Our History Group did not have enough funds to cover these costs and after many months of applying for grants we were finally awarded a Heritage Lottery Fund grant in July 2013. 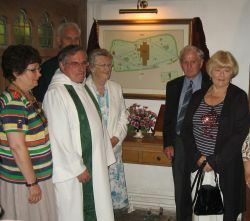 Work started in earnest and once the data had been collected we were able to proceed with creating the database and a professionally drawn up Plan and on the 7th July 2013 we held the unveiling ceremony in St Swithun’s Church. We realised that with the creation of a website, genealogists all over the world would be able to access the data contained on our gravestones at the same time being able to see a photograph of the memorial stone. The results of our project will also be included on the curriculum of Pyworthy Church of England School, and this will enable the children in our Parish to trace their ancestors. One of our events this year was a talk by Janet Few on "What our Ancestors would have died from". Janet Few is now in her fourth decade of family and community history research, specialising in the South West of England. She is working on the community history of several North Devon parishes and is the project manager of the Clovelly Community Archive Association. Our current and most ambitious project so far is indexing the gravestones in our Parish Church, St Swithuns.